Spun traces the backstory of Amber Sheppard who appeared in McKenzie’s novel Spin. I read Spin a couple of years ago so I confess that I started reading Spun with very little in way of pre-conceived story line. 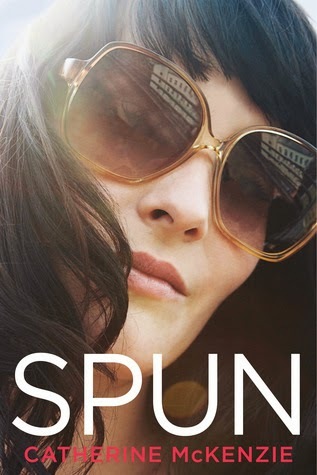 Spun is a quick paced novella with more action and dialogue than one could normally expect from a hundred odd pages and I love McKenzie’s writing so I was pleased that she could also pack so much into such a short format. Spun is both heart-breaking and hilarious and Amber’s narrative is realistic, I would presume, for a starlet under scrutiny. Not being a 20 something actress just out of rehab myself though, I could still relate to her confusion with regards to her feelings about the love of her life (who, by the way, isn’t good for her- at all). Our impression of this past love is suspicious from the outset but I think we were given enough detail of their good times to absorb that Amber wasn’t completely delusional to want him. As for the other people in Amber’s world, I was particularly concerned when her close friend (and publicist) Olivia gives up a secret that should have turned Amber’s life into total destruction mode- but it turns out that the starlet could really have her act together (despite the media pushing otherwise)? I was so disappointed for her distance from her parents, though McKenzie doesn’t write them as entirely unsympathetic there wasn’t enough warmth there for me to think that their future relationship would be suddenly a bed of roses. McKenzie skillfully wrote a main character that is relatable across many age groups and I would challenge people to not find empathy for her situation. Without giving much away this novella is full of intrigue, life and truths and I whisked through it happily. Thank you to the author for our review copy. All opinions are our own.